The University’s endowment was valued at $37.6 billion on last June 30, the end of fiscal year 2015—a gain of $1.2 billion (3.3 percent) from a year earlier—finally exceeding the peak value (not adjusted for inflation) realized in fiscal 2008, just before the financial crisis. The fiscal 2015 appreciation reflects investment returns during the year (perhaps $2.0 to $2.2 billion—exact figures appear later this fall in Harvard’s annual financial report), minus distributions for the University’s operating budget and other purposes (perhaps $1.6 billion), plus gifts received as The Harvard Campaign proceeds (see “$6 Billion-Plus”). But that nominal achievement was overshadowed by the relatively modest 5.8 percent rate of return on the assets invested by or under the purview of Harvard Management Company (HMC). 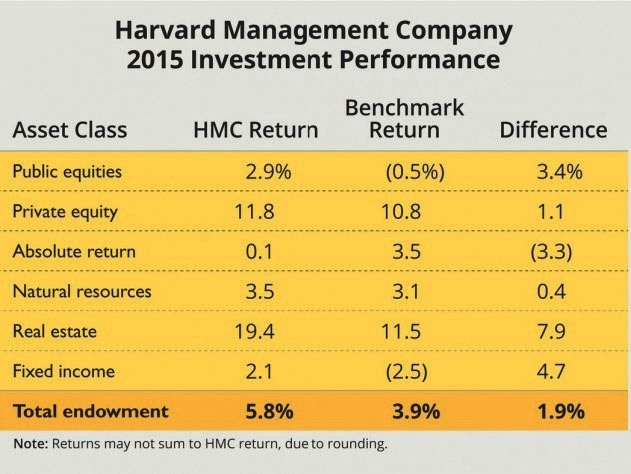 In a September 22 letter announcing the results, Stephen Blyth, HMC’s president and CEO since last January, starkly outlined the endowment’s diminishing investment margin relative to its market benchmarks; its recent performance (lagging several peer institutions’ funds); and new objectives and strategies intended to improve performance consistent with the endowment’s role in financing Harvard’s “preeminence in teaching, learning, and research,” as his new HMC mission statement puts it. Given the relatively challenging investment environment, the 5.8 percent return (after expenses) trailed the 15.4 percent return HMC realized in fiscal 2014. Real-estate and private-equity assets contributed disproportionately to the gains (see chart); holdings of public stocks produced modestly positive returns, as U.S. equities appreciated (up 12.4 percent), but foreign and emerging-market portfolios produced losses. The buffering expected from absolute-return (hedge-fund) holdings was barely realized, clearly a disappointing underperformance. Citing an expectation that the endowment should outperform market returns by at least 1 percent on a rolling five-year average annualized basis, Blyth observed that HMC did well from fiscal 2000 through 2008, beating its benchmarks by 3.8 to 6.5 percentage points. But that margin declined thereafter—falling short of the one-point margin in fiscal 2012 and 2013, and averaging only about 1.1 percent during the past six years. He reported that among a cohort of 10 other universities with managed assets ranging from $25 billion down to $9 billion, HMC’s performance (measured on the five-year basis) fell in the second quartile from fiscal 2000 through 2003; rose to the first quartile from 2004 through 2008; declined to the third quartile during the financial crisis and recession in 2009-2010; and declined further, to the last quartile, from 2011 through 2014. Different rates of return on huge endowments ultimately translate into a difference of hundreds of millions in funds available to support institutions’ academic and operating budgets. HMC’s 10-year annualized rate of return is now 7.6 percent, its 20-year figure 11.8 percent; for Yale, the comparable rates of return are 10 percent and 13.7 percent. • a more nimble investment process. Blyth sketched collaboration and cross-asset-class investments taking advantage of the HMC staff’s aggregate knowledge. • and, always an issue for HMC, with a significant share of assets under internal management by highly paid professionals, a revised compensation system that would apparently tie incentive pay not only to each portfolio’s outperformance relative to its asset class, but also to HMC’s aggregate performance on Harvard’s behalf, in keeping with the mission statement. He concluded on a personal note, emphasizing that “I know that my colleagues…share deeply the special role that HMC plays in the support of our great University. Read a full report at harvardmag.com/endowment-15.